We are JesseJames Creative. How can we help you? We deliver a full range of highly integrated on- and off-line marketing services. We live and breathe user experience and nowhere is that passion more visible than in the websites, Intranets, apps and support systems that we architect, design and build. 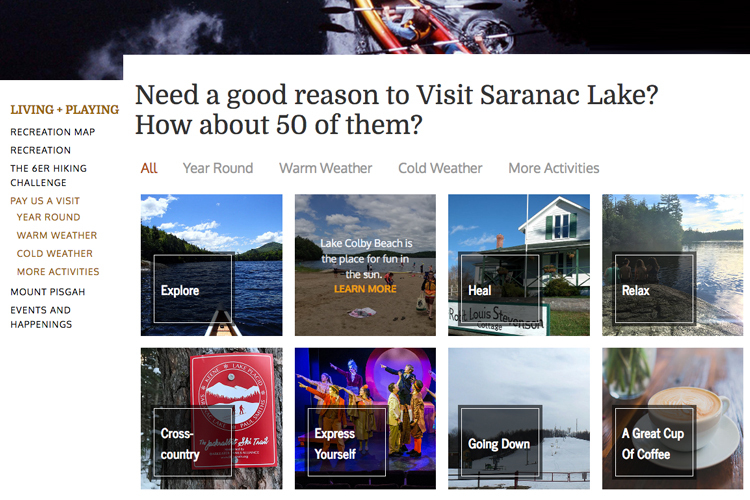 If it can be done in a browser, chances are we’ve done it. 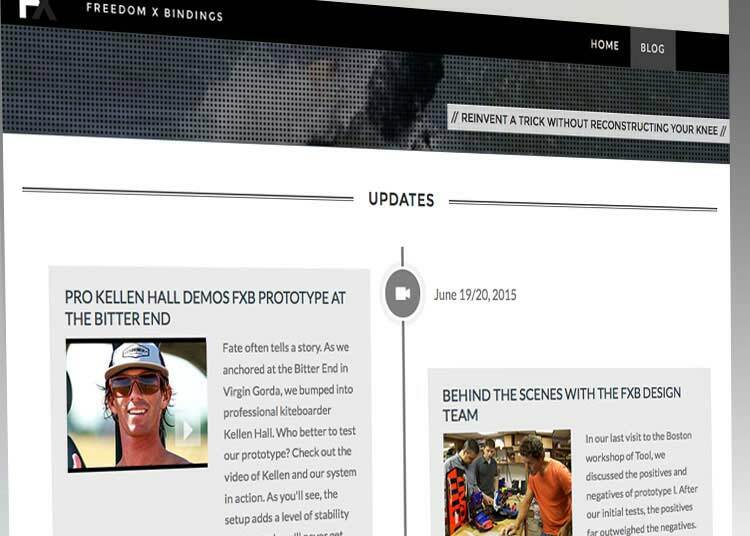 We deliver great branding, award-winning content creation, sleek UX and insane usability on every project we take on. 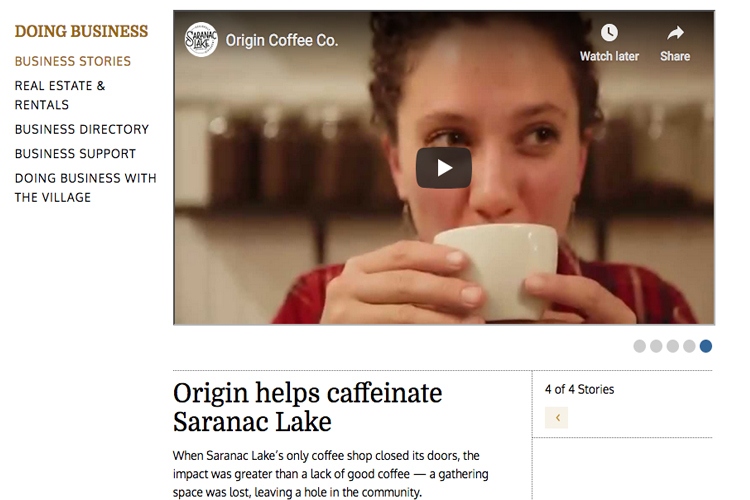 While we have experience with every enterprise and open source CMS solution out there, we are partial to our own content (and business) management platform, OrgCentral-the most intuitive and powerful CMS on the planet. 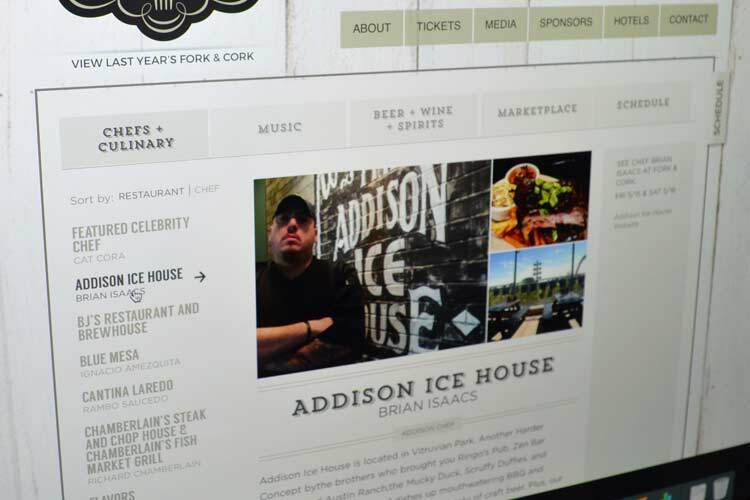 Reimagining the look and feel and overall messaging of great businesses is something we do on a daily basis. What makes you tick? What does your storytelling look (and feel) like? What makes your products so extraordinary? What are you not saying that you should be shouting? And why should anyone care? From naming to logos to lookbooks, we’ll help you define all of that, get to the heart of the matter and communicate it a way that will make people care deeply. And buy often. We can design like a great design firm, strategize like a big ad agency and do interactive with the geekiest of them. Whether you need a new ad campaign, a training video, a catalog, an email campaign, a unique leave-behind or an unconventional event invitation that will have people knocking down your door, we can help. We just hope you don’t have a problem being the center of attention. After 25 years in business, we've seen and done a lot. That experience...that body of work...the relationships we’ve formed...the things we learned...allow us to bring many intangibles to our client partnerships—things you won’t see on a statement of work (nor on your invoices for that matter). An introduction...access to a network of influencers you may not have known were out there...a supplier who can save you money...or simply a really fresh way of looking at something you may have been taking for granted. Let’s put our heads together and watch the awesome happen. 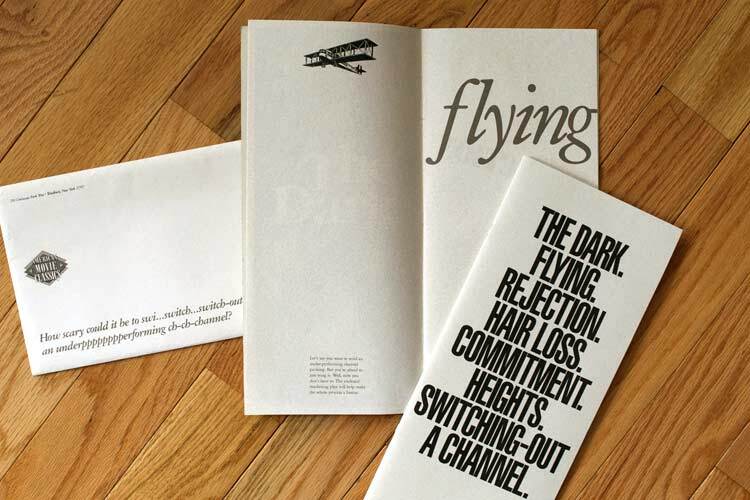 Established in 1990, JesseJames Creative is a fully integrated marketing communications firm based in New York. We deliver expertise in interactive marketing and strategy, website and web application development, mobile, consumer and B2B advertising, branding and direct response programs. We have intentionally maintained a flat organizational structure so that we don't bog down our clients (or ourselves) in meaningless rhetoric and extra paperwork. We are creative thinkers in every area: marketing and branding, promotion, interface design as well as project management and technology. We live and breathe customer experience. We build relationships with our clients and their customers. Structured where it needs to be, but nimble enough to allow for innovation at every step, our process is designed to streamline every aspect of a project and deliver maximum ROI and minimize your time to market. To us, the great Herb Kelleher, CEO of Southwest Airlines, said it best: "We have a strategic plan...it's called doing things." If you have a sense of humor, love doing great work, cherish having a life outside the office and aren't allergic to dogs, Drop Us a Line. We're always in the market for inspired art directors, designers, coders, copywriters and conceptualizers. 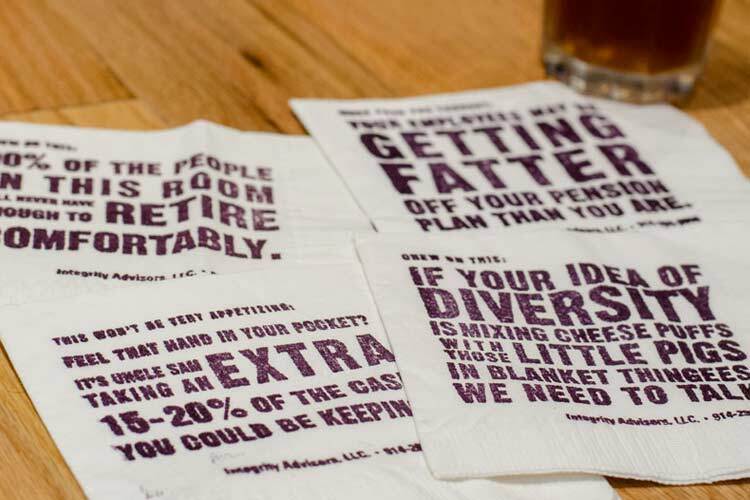 In 20+ years of business we’ve had more than our fair share of big ideas. Lately, we’re turning some of them into products. From a CMS that’s so powerful...so intuitive, it makes other systems feel really bad about themselves, to a 100% customizable CRM system to an online tool that allows organizations of all types to monetize unused spaces, we’re always thinking around here. What can we be thinking about for you? OrgCentral is the lovechild of CMS, CRM, ERP and LOL. A single platform that does the superhuman work of many, gives organizations full 360-degree visibility into their businesses, keeps the right hand apprised of what the left hand is doing and makes people smile when they use it. Learn More. Available as part of the OrgCentral suite or as a standalone, this powerful system is designed to showcase, reserve and monetize (Ka-Ching!) available spaces--in a city or town, within a single corporate office or across continents. Get a room already! Uber CRM (Customer Relationship Management) is designed to be "The CRM for the rest of us." With full self-service customization (as in no army of consultants with their hands on your wallet), no per-seat pricing nightmares and scalability for even the largest organizations, it's easy to see why we call it Uber. Get Connected. We’re usually too busy working to add everything we do to this section, but the highlights below should give you a sense of the things we create around here. 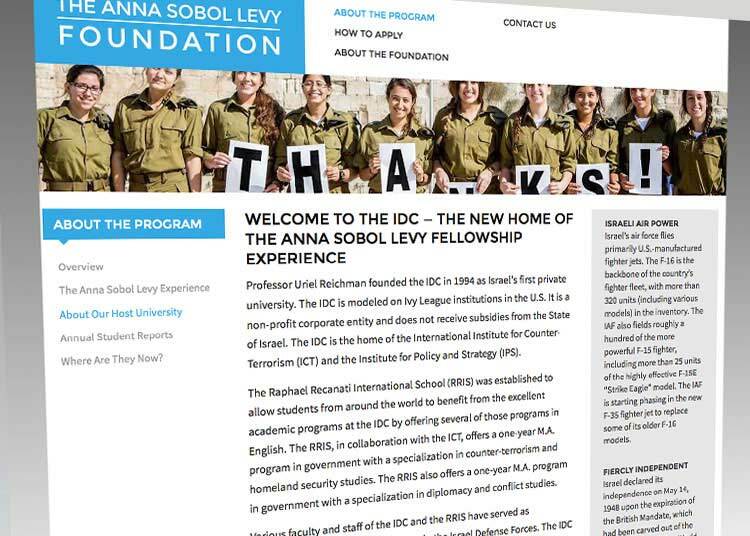 This is just the tip of the JJC portfolio iceberg. Contact us to see more. And to see what we can do for you. Using Produce to Produce Results. If the idea of sitting through an all-day sales seminar sounds painful, you haven’t attended one of Jack Daly’s “Smart Selling” seminars. 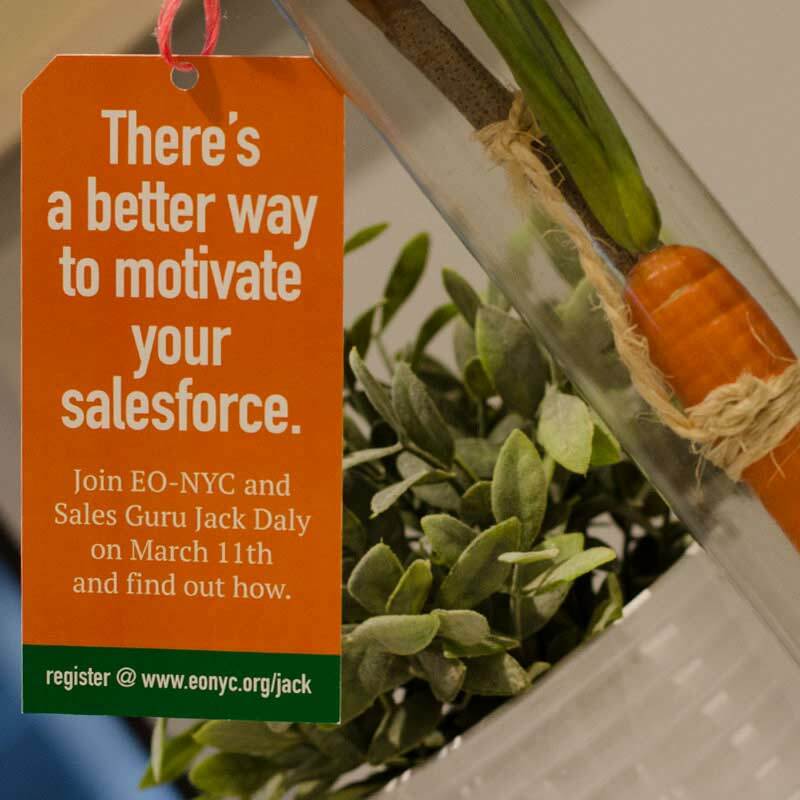 America's preeminent Sales Guru, Jack's infectious energy is off the charts and his ability to communicate immediately actionable ways to increase business is remarkable. Getting “Jack'd” as it has come to be known, is a must for any business owner or team. 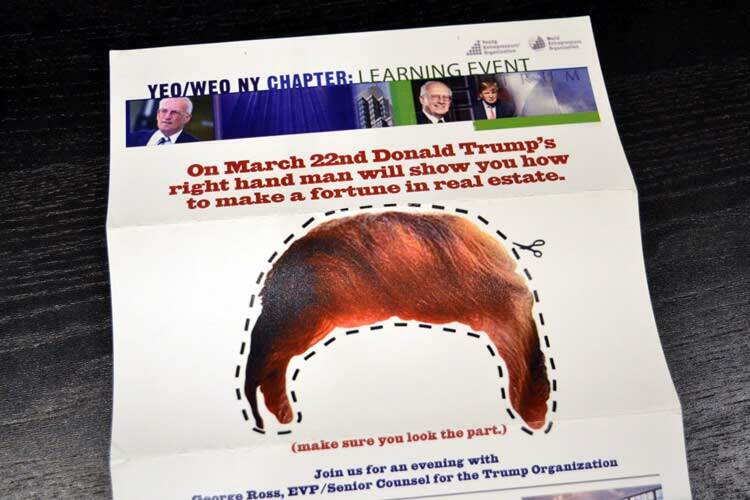 When the NY Chapter of The Entrepreneurs' Organization invited Jack to speak, they knew a standard invitation would not get the job done. (Getting the attention of 200 busy Entrepreneurs is no easy task, and as such, attendance was down at Chapter events that year.) Enter the JJC team. 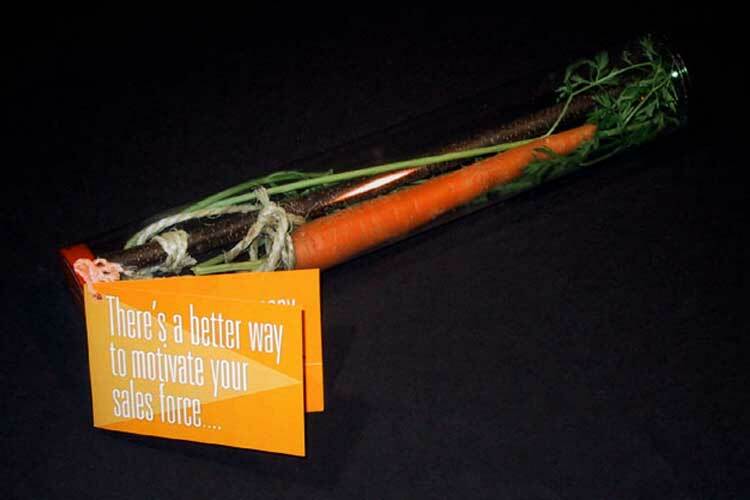 To let everyone know about this must-see event, we hand delivered clear tubes with a real carrot and stick inside to every member in the chapter with a hangtag telling them that there was a better way to motivate their salespeople. As the packages hit people's desks, the invite itself went viral and the event sold out in hours. 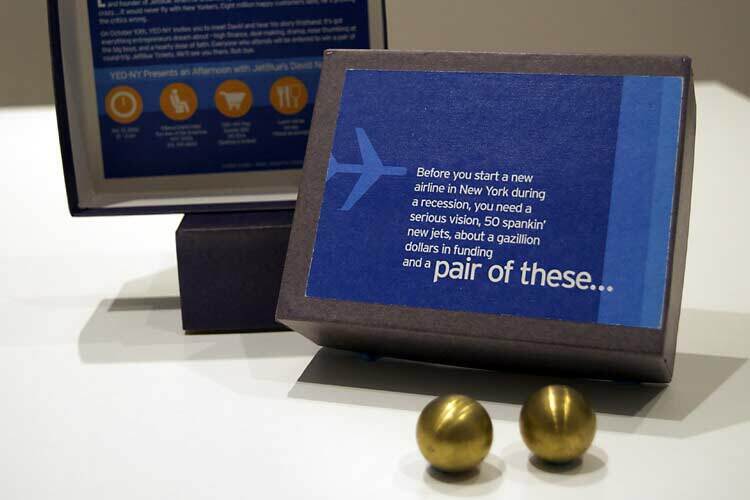 When Jet Blue asked us to help them promote an event featuring their visionary CEO David Neeleman, we were happy to get on board. The target audience was busy NYC business owners and road warriors, so we knew we had to do something that would break through and entice an audience of hard chargers who usually didn’t stop for lunch, much less take an entire afternoon off to join us. Playing off the guts (ahem) it took JetBlue to launch a new airline in the midst of a recession, the invite we sent out raised more than a few eyebrows and sold out the event in one day. This is how a modern city rolls. In 2012, JJC began a wonderful relationship with The City of Edina and launched a brand new, fully rebranded web presence and CMS system. 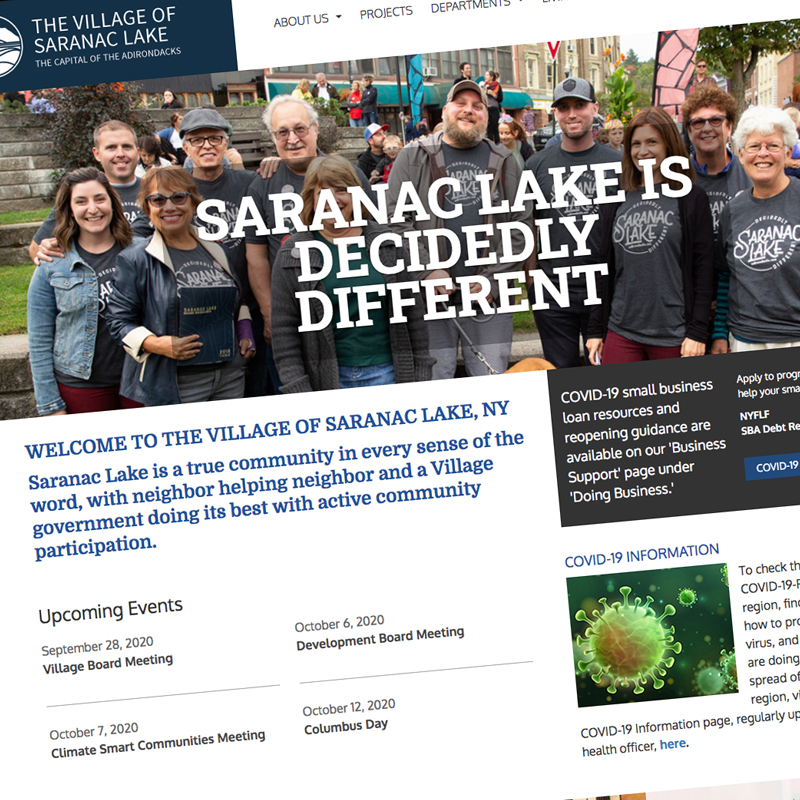 We re-created every city department section and designed microsites for their larger facilities, bringing the entire enterprise under a single CMS system. 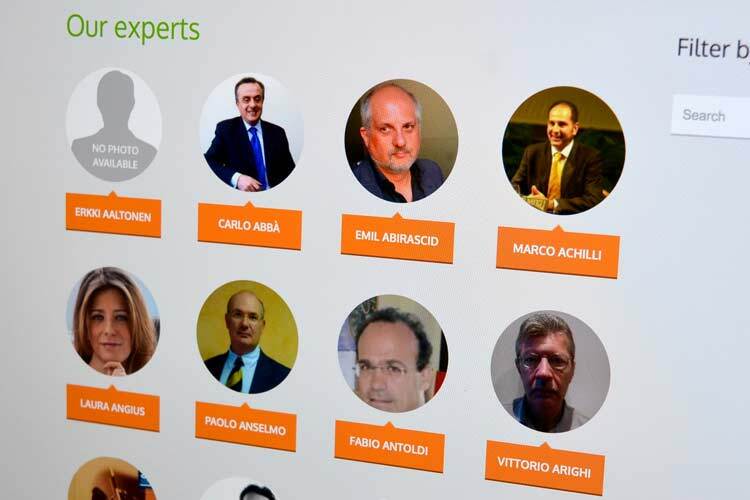 A secure OrgCentral-powered extranet, with LDAP integration helps keep things humming for the city's staff behind the scenes. To this day, the site continues to evolve and we continue to deliver innovative, time- and resource-saving features and functionality for Edina. Architecting a Great Success Story. When an MIT dropout was ready to disrupt the multibillion-dollar AE industry with a breakthrough project management and accounting system, we were there to help. 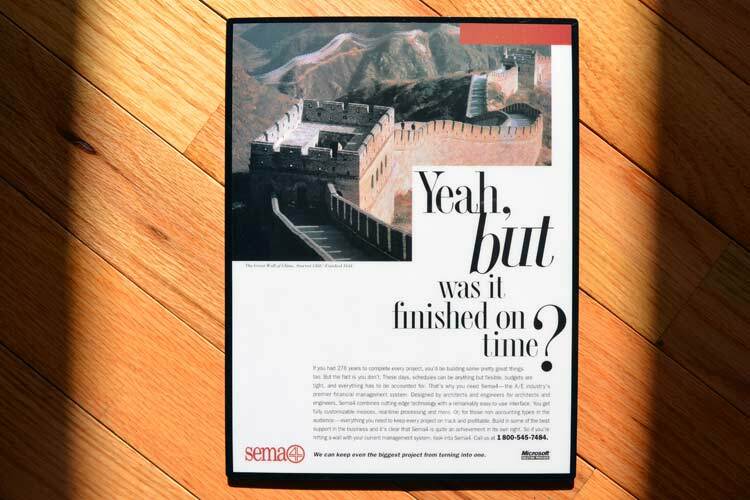 Our irreverent, often brash, work for Sema4 really set the tone for the brand and included advertising, direct mail, sales collateral, guerrilla marketing and training materials. The work had some serious attitude (just like the company and product it was done for) and really helped get the attention of an audience used to the same old, same old. As the product continued to gain momentum and market share, the company was snapped up by the largest old school player in their space, who, recognizing the threat posed by the leaner and decidedly meaner Sema4, figured, "If you can’t beat 'em, join 'em." 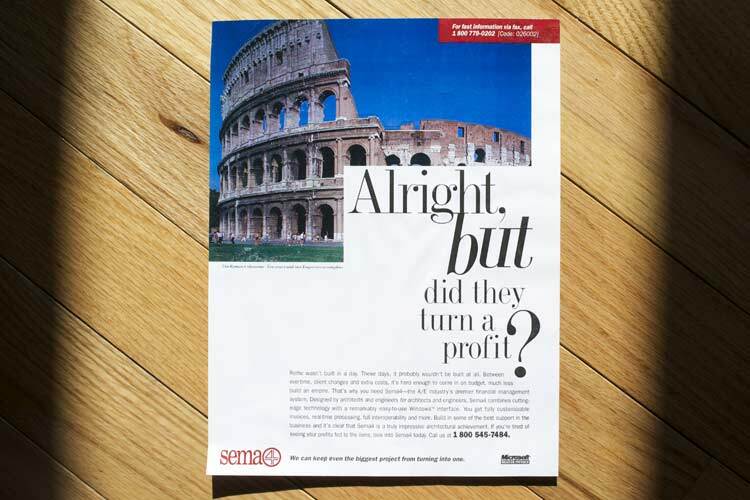 Our irreverent, often brash, work for Sema4 really set the tone for the brand and included advertising, direct mail, sales collateral, guerrilla marketing and training materials. The work had some serious attitude (just like the company and product it was done for) and really helped get the attention of an audience used to the same old same old. Moving the tourism needle for a great town. 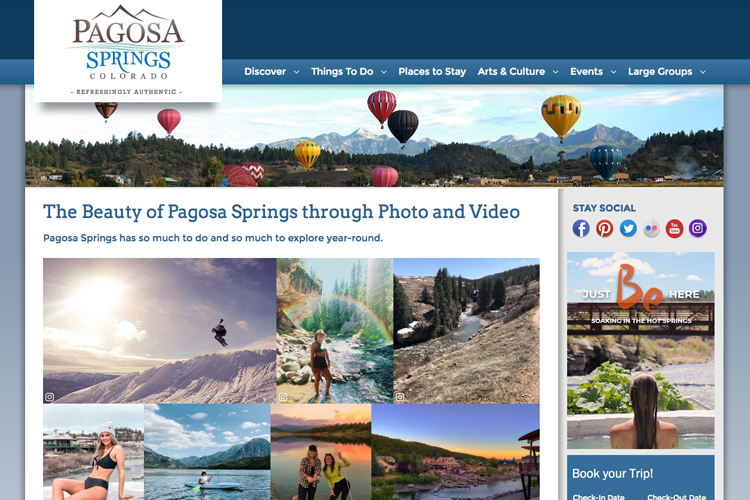 With a hot spring running down main street and 400+ inches of super skiable powder per year, Pagosa Springs is a year round destination with something for everyone. 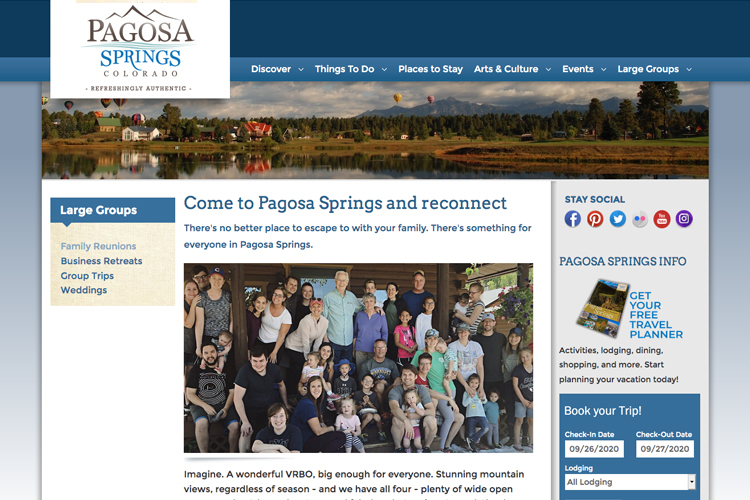 The new site we created for them has helped raise Pagosa's profile nationally. 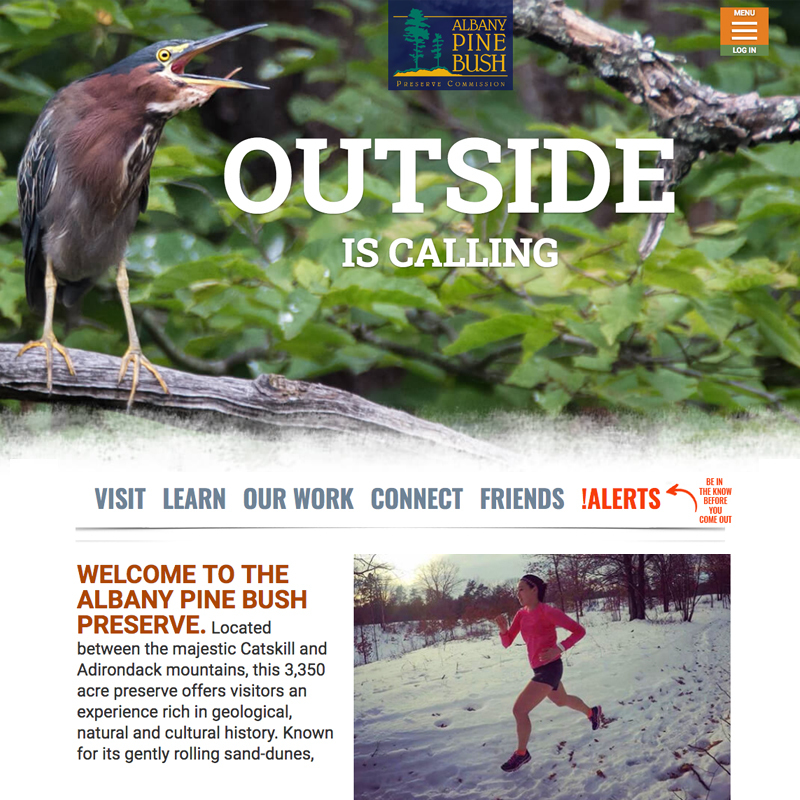 We did the website, a mobile site, a Visitor Center Kiosk and more. Regardless of the medium, it's all starting to click—visitor days and tourism spend are both way up. 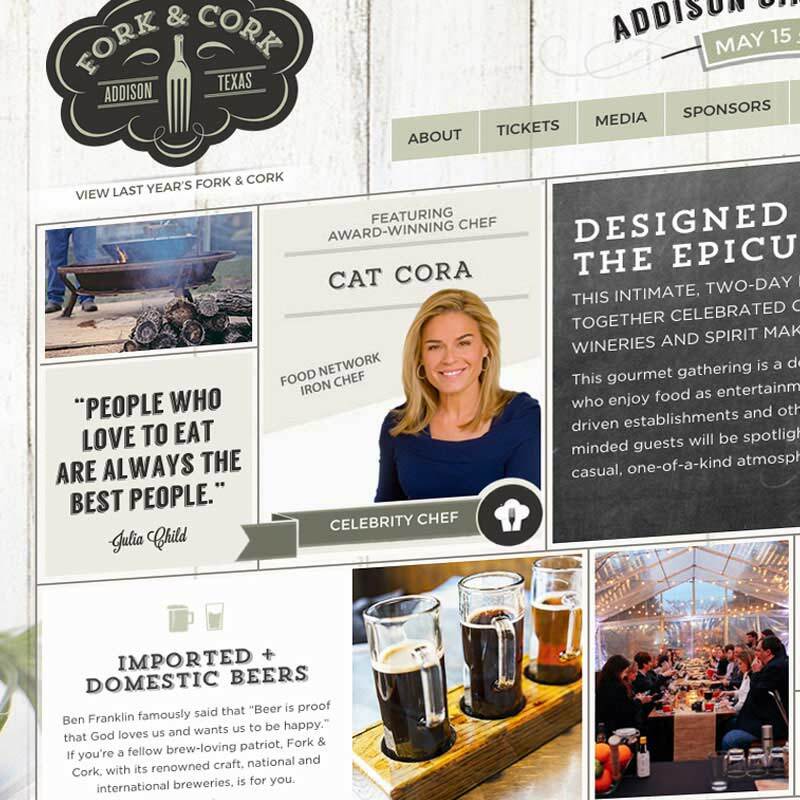 Serious design for serious eats. Addison, Texas, is one happening place. A series of special events draws nearly a million visitors to town every year. When their marquee event, a two-day food and wine festival, was being rebooted, JJC was given a seat at the table. 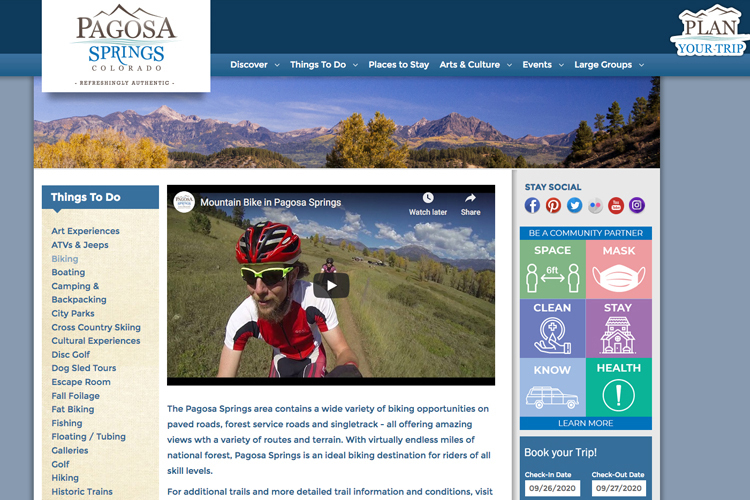 (We redesigned Addison's main city site as well.) 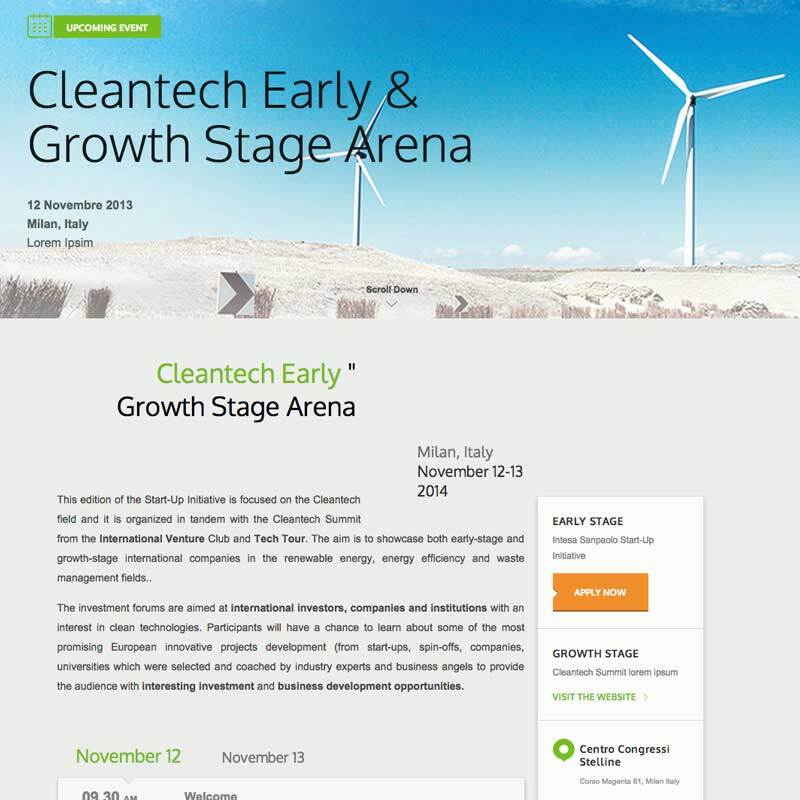 The standalone site we created (with an OrgCentral-powered CMS of course) raised the bar significantly and became a key driver of awareness and ticket sales. 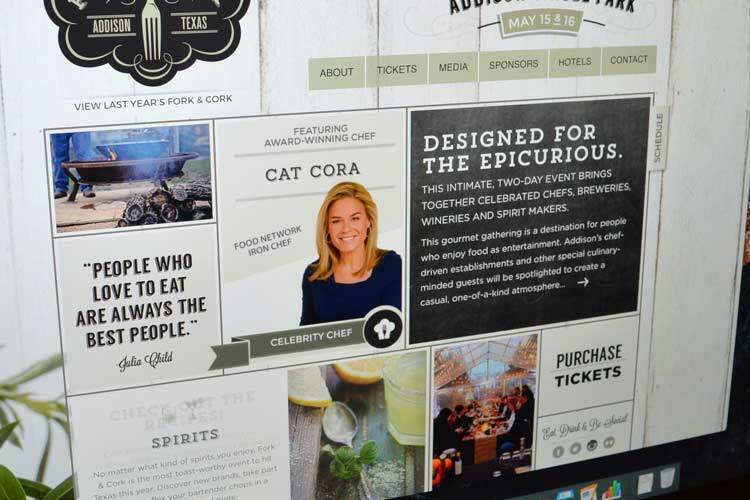 Based on the sucess of Fork & Cork, the city asked us to create sites for the rest of their special events as well. 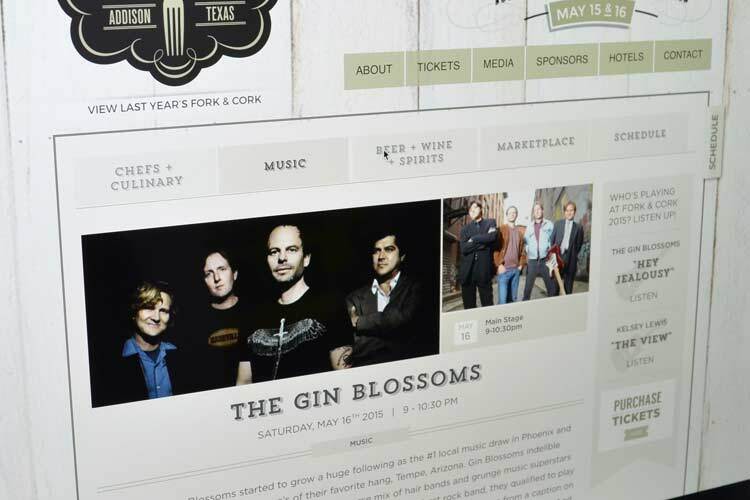 Now Kaboom Town, Octoberfest and the Addison Summer Series not only look great, but they are all manageable via a common CMS that is smart enough and flexible enough to handle anything their events team can throw at it-from sponsors to advertising to ticket sales. When it comes to launching a business, the smart money is always on JesseJames Creative. When a group of top advisors left one of America's biggest banks to pursue their own entrepreneurial dreams, they didn't go it alone. JJC was there to create their logo and identity program and help handle the firm's launch. 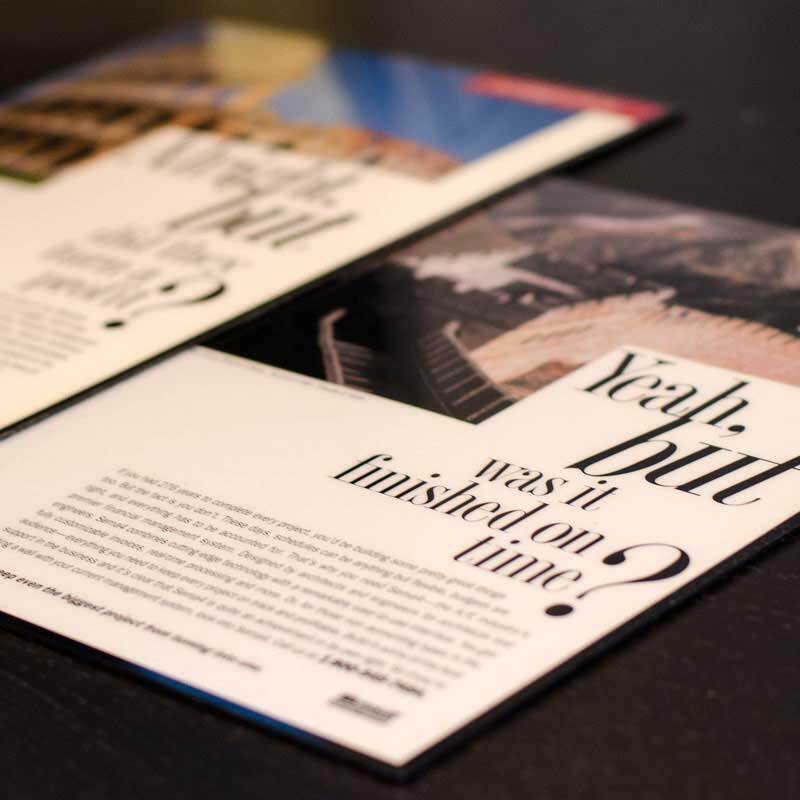 After branding the firm, we produced a series of immersive, invitation-only events at top Manhattan venues, to help them quickly gain mindshare in a crowded "me too" space and ultimately secure some of their first high-net-worth clients. 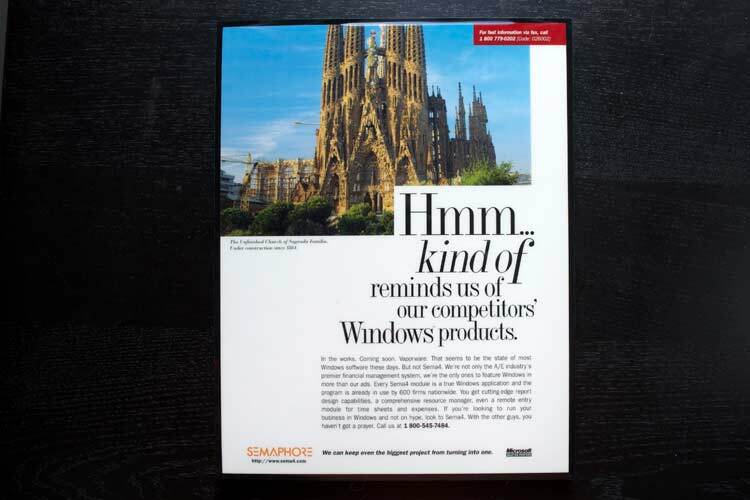 We eschewed glossy and other standard (and disposable) collateral and instead delivered the firm's message via guerrilla-style messaging during the events. 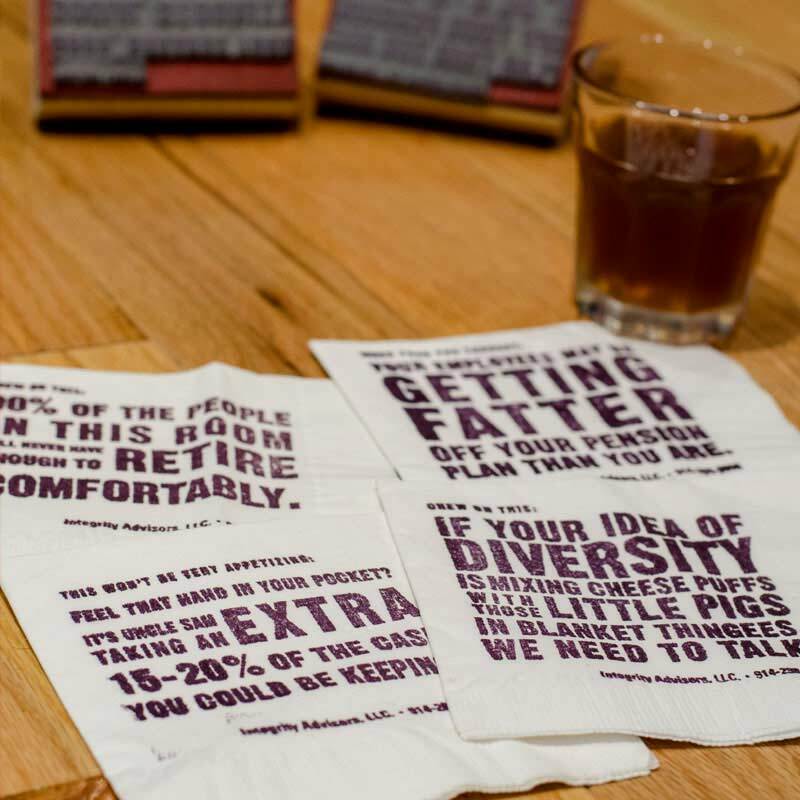 This innovative and irreverent multimedia barrage included cocktail napkins, coasters, custom drink recipes, dynamically printed attendee badges, wall projections and even rest room signage. ROI for the series was extremely high and we heard from the client that this was one of their best investments ever. We are extremely proud to have helped launch a major new player into the multi-billion dollar fantasy sports space. 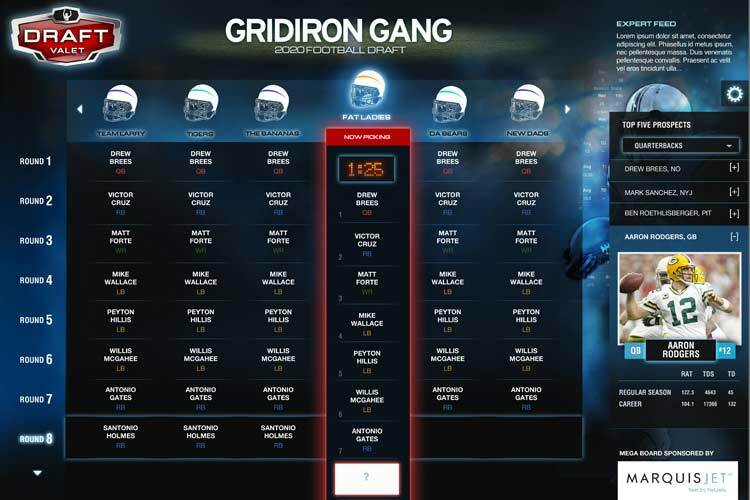 Draft Valet creates once-in-a-lifetime fantasy draft experiences that closely mirror the live draft day drama that happens in pro sports. They also provide in-season, expert level, advice designed to give teams in the know, a decidedly unfair advantage. JJC was recruited to help build the brand from day one. We created the company's logo, launched their first website, helped produce their inaugural series of events and conceived and built what you see here: The MegaBoard--a JumboTron-sized behemoth that runs an in-person fantasy draft in real time complete with big data integration, a mobile Smack Talk app, personalized expert advice and much more. Are you ready for some football? Over the years, we had the priviledge of working with some of the best networks on TV. We launched the History Channel for A&E, helped the Independent Film Channel gain some mainstream exposure for Bravo and as you see here, helped convince notoriously finicky cable operators that American Movie Classics was the one channel they could never go wrong with. When Nike was ready to launch the customizable Presto sneaker, they turned to JJC and Clifford PR to kick things off. 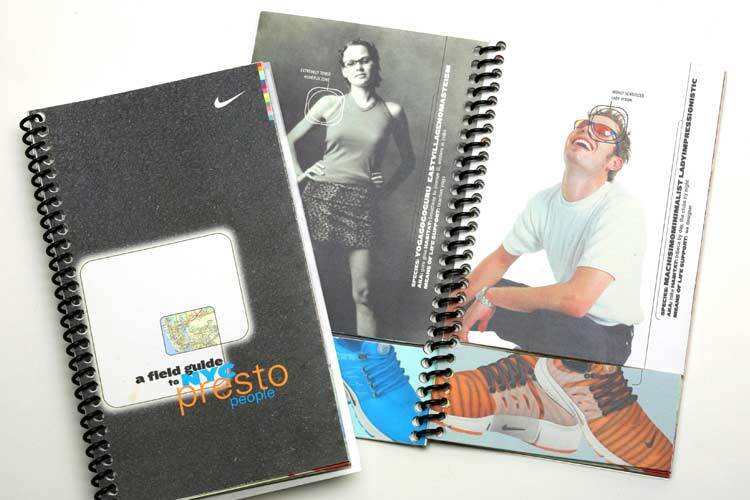 We created all kinds of promotional goodness for the Presto campaign including some way-out-of-the-box press outreach materials, invitations and graphics for a series of global kickoff events, and the piece you see here—an old school flip book that let viewers match Archetypical New Yorkers with just the right Presto shoe. 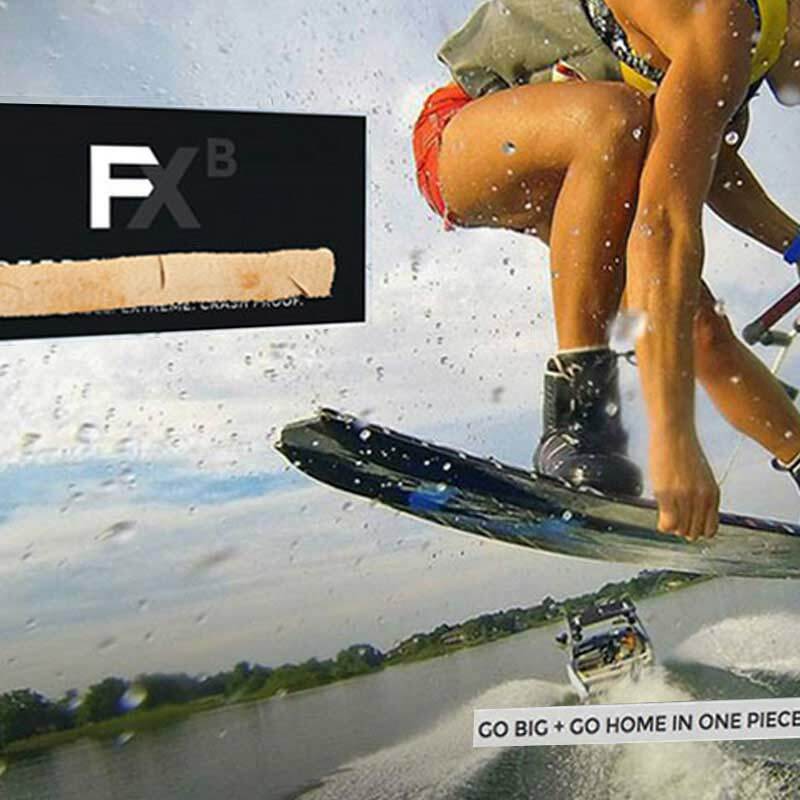 For this action sports startup, It's always go big or go home. 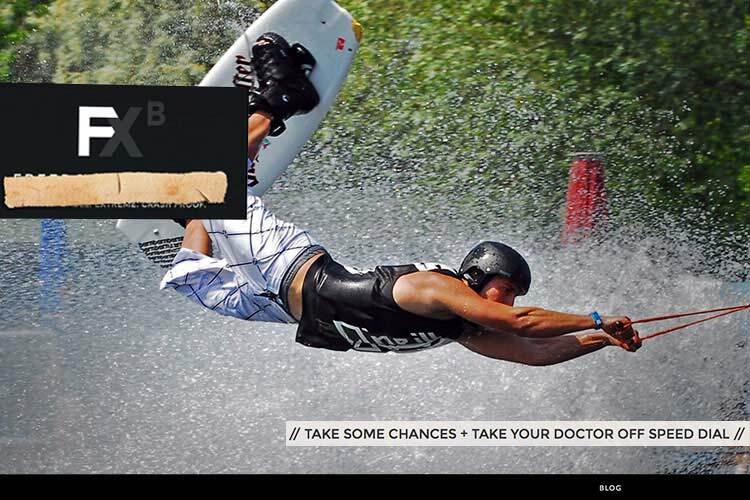 When some of the top (and by top, we mean crazy) minds in kitesurfing came up with a binding idea sure to revolutionize water and snow action sports, they turned to JJC to help spread the love. We named the comapny, did the branding, worked with them to put together an industry partnership program and launched a teaser website, putting the world on notice that from here on, going big was going to be a whole lot safer. The uber guide to German art and culture. Sponsored by the German Consulate and powered by our OrgCentral platform, Germany in NYC is the definitive online guide to all things German in our fair city. Appealing not only to German expats and citizens living an working in NY, but New Yorkers themsleves, the site has been hugely successful since its launch. The back-end allows a single editor to do what should be the work of multiple people, making updates to every section, managing hundreds of active events, selling advertising, staying in touch with an integrated email blast function and much more. Georgia is Always On Our Minds. 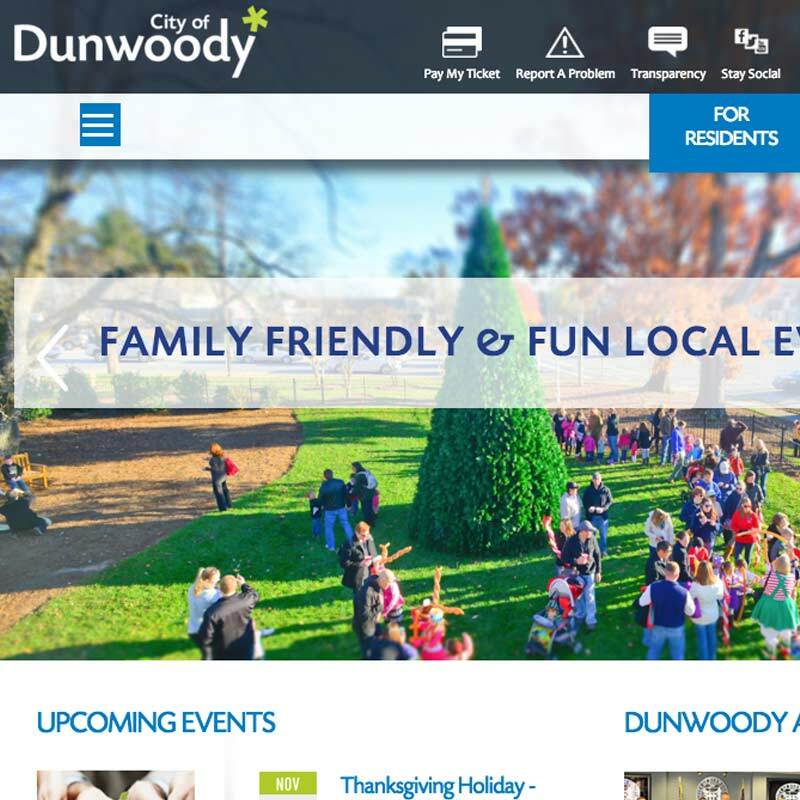 When the City of Dunwoody, one of the fastest growing cities in the Atlanta metro area, was doing a rebranding, they looked North to JJC for the interactive portion of the effort. 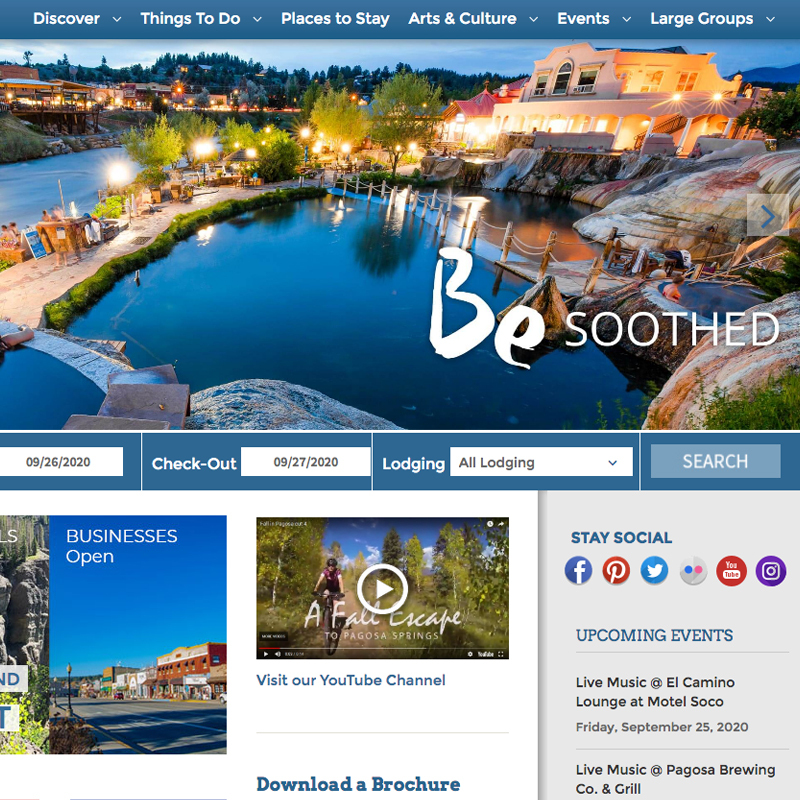 Powered by a highly intuitive CMS, the site we designed and built, organizes every aspect of this dynamic City into one easy-to-navigate site. 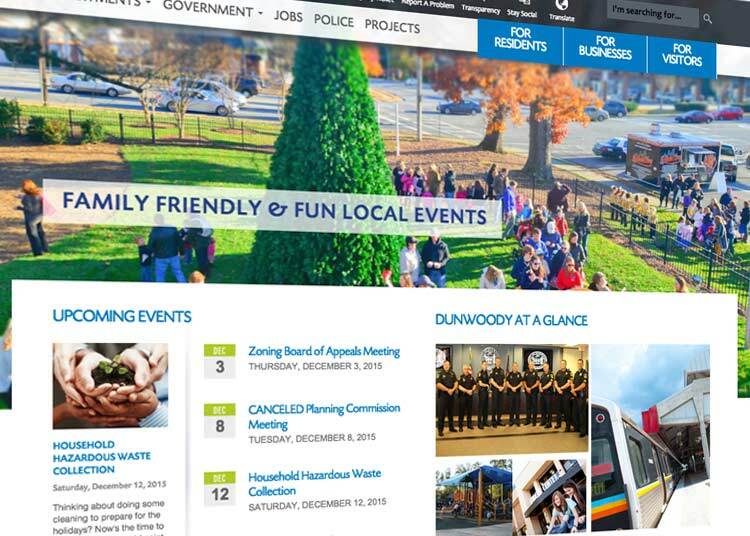 Residents, businesses and prospective residents can now find everything from voter information to documents to a robust online events calendar and program registration system. Department teams now self-manage their own corners of the site using a consistent set of tools that makes everyone a web genius without even trying. 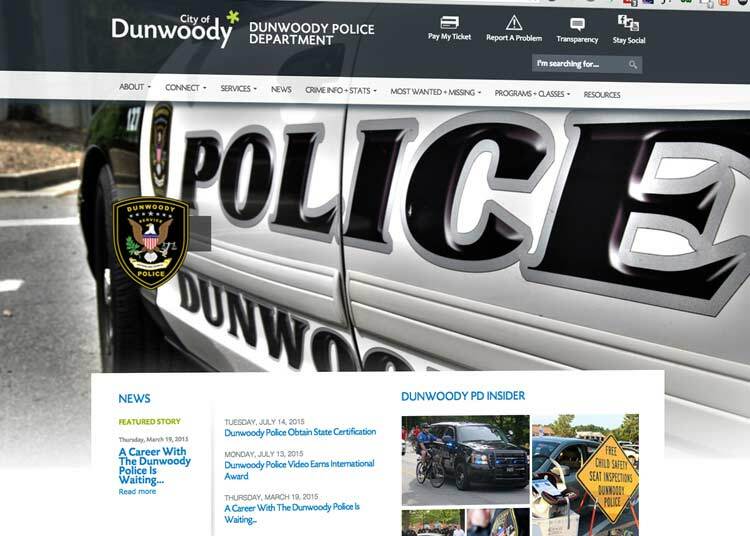 When the Dunwoody PD decided they wanted a site of their own, we were able to quickly spin up an “arresting’ microsite for them using the very same CMS that the rest of the city now depends on. Along the way, we also able to streamline a number of other operations and save the city some money on external software licences and spare them the nightmare of having to train staff on 19 different pieces of software. Custom OrgCentral modules now handle job recruiting, procurement, document management and much more. 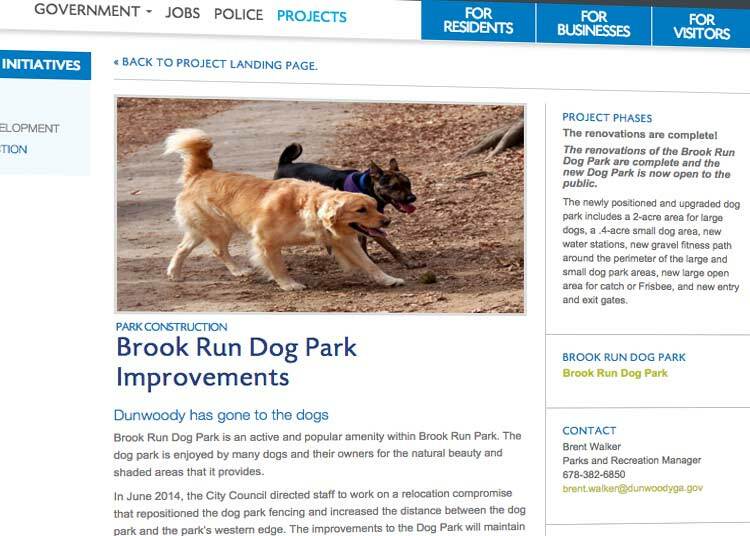 We even put together a module to showcase, with 100% transparency, the many capital improvement projects the city has going on and automatically archive them when they are finished. 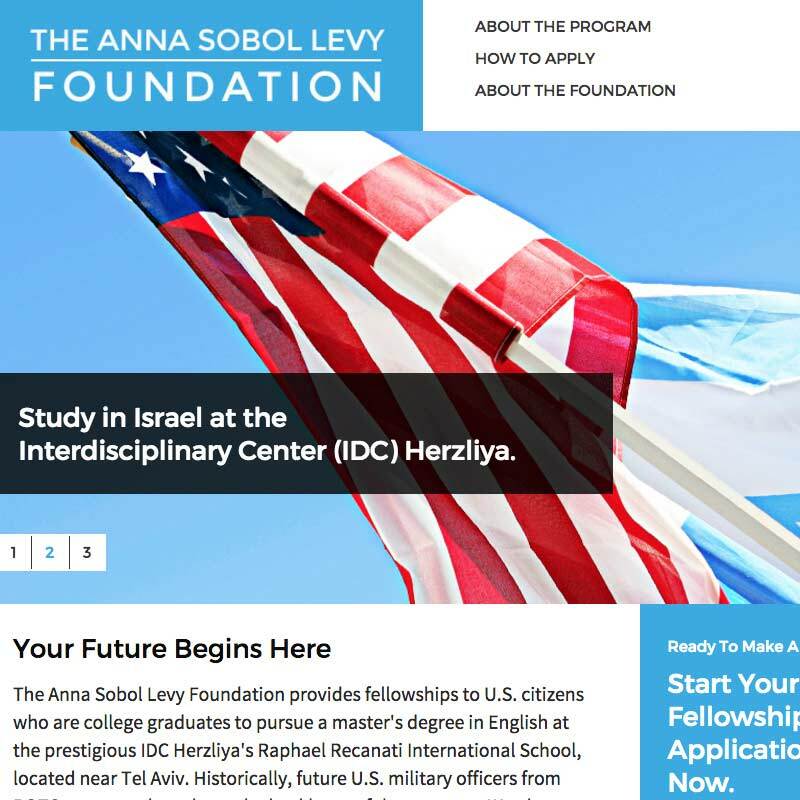 The Anna Sobol Levy Foundation provides fellowships for US college graduates to study in Israel. 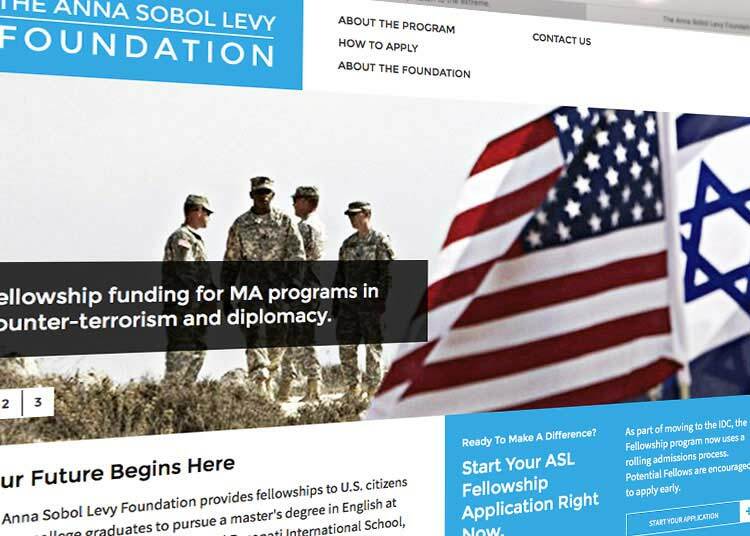 This unique program provides Fellows with a concentrated, experiential education that covers issues such as global security, counter terrorism, international relations and diplomacy. 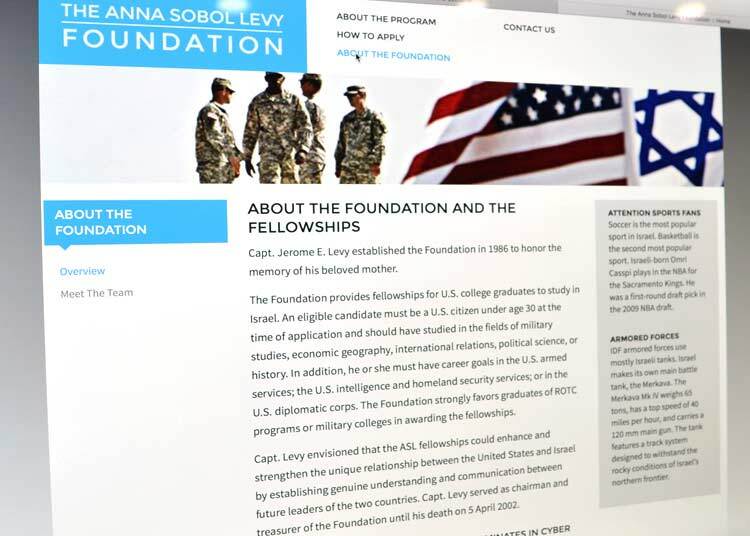 JJC helped rebrand the foundation and create a dynamic website designed to raising awarenes of The Foundation internationally and attract more qualified applicants to the program. Behind the scenes, a secure members-only area provides sense of community and a place where program alumni from the past 16 years (and current fellows) can get to know each other better, share experiences, network and trade opportunities. 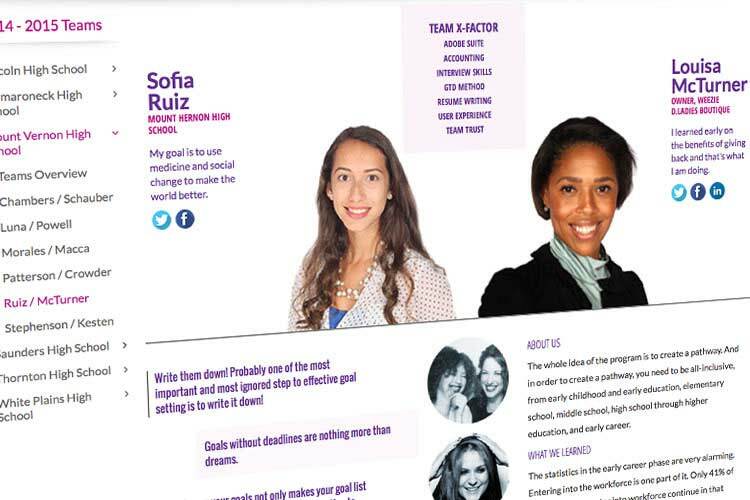 Building female leaders one high school at a time. 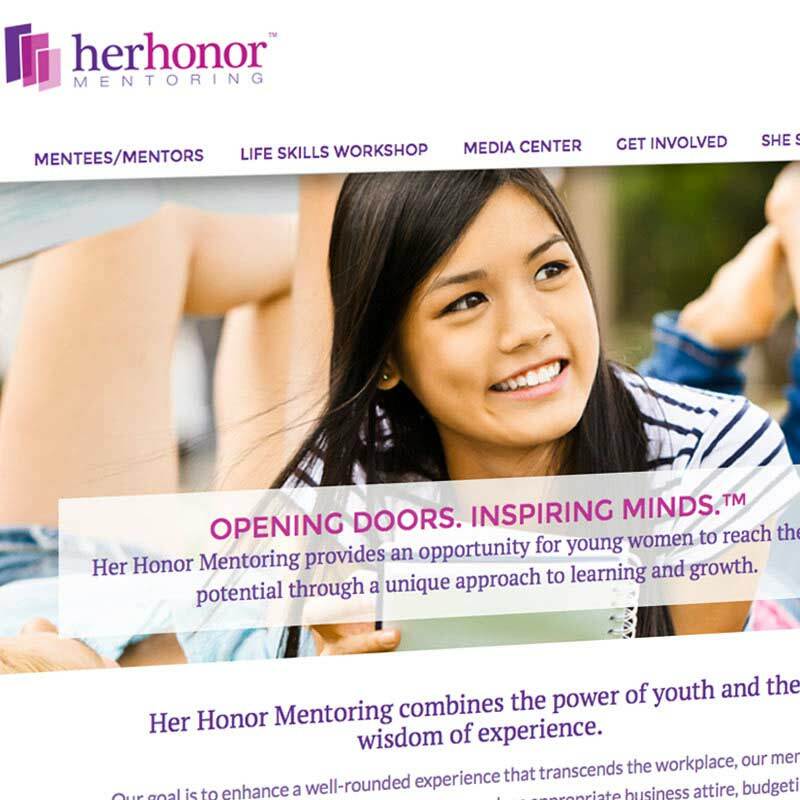 Her Honor Mentoring (Judge Judy's Nonprofit) seeks to provide a platform for young women to reach their full potential. Practical skills to realize a life full of promise are attained through a structured framework for learning and growth. Through one-on-one mentoring, intimate seminars and unique experiential learning, the program endeavors to reinforce the importance of college education and ultimately a meaningful profession. Young women achieve a sense of confidence and independence that will lead them to a career guided by their passion. When Judy and her daughter Nicole (who is responsible for the vision of the organization and all day-to-day operations) launhed Her Honor in 2011, JJC did the branding, designed the public-facing website and built out a suite of web-enabled systems to automate and streamline the business end of the organization-everything from recruiting to mentor matching to time sheets, invoicing and event management. Girl Power! 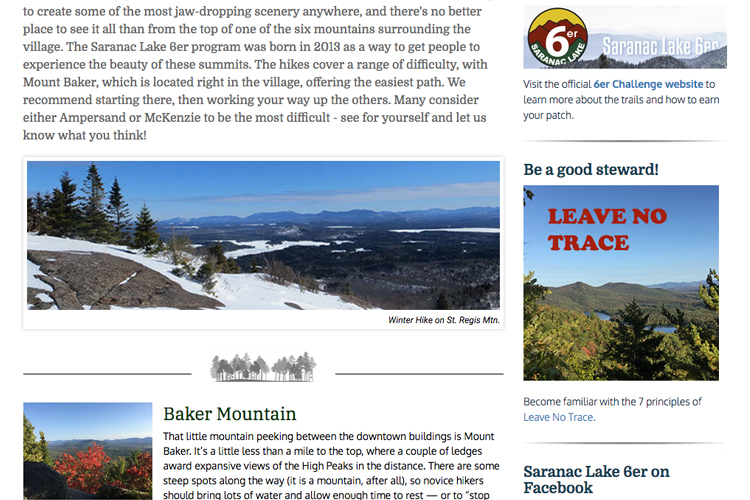 A major redesign just launched. Irreverent, but right on point. Serious branding for serious eats. 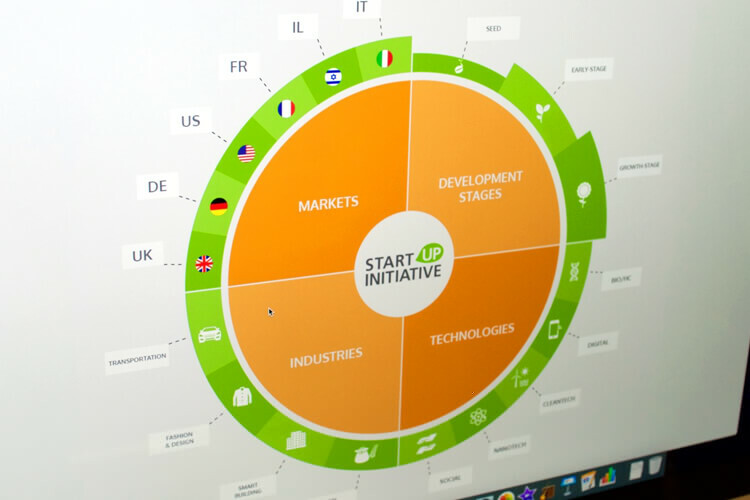 From True Startups to New Ideas for Big Brands, We Know How to Make an Impact Fast. Going big: Our most intense startup story yet. “People do that on Facebook and it's the dumbest thing in the world. I don't care what your dinner looks like. Jesse co-founded JesseJames Creative. Prior to getting the entrepreneurial bug, she worked at a number of top New York ad agencies, where she created successful print and television campaigns for clients such as McDonald’s, Clairol, HBO Video, American Movie Classics and Chase. An award-winning copywriter, Jesse is responsible for developing the words, content and overall messaging that power our projects. 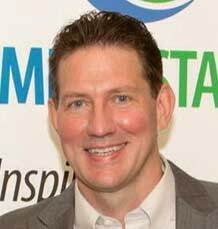 As a co-founder of JJC, Jim brings a wide range of experience to the firm including work for CBS Records, Nike and the Meredith Corporation. 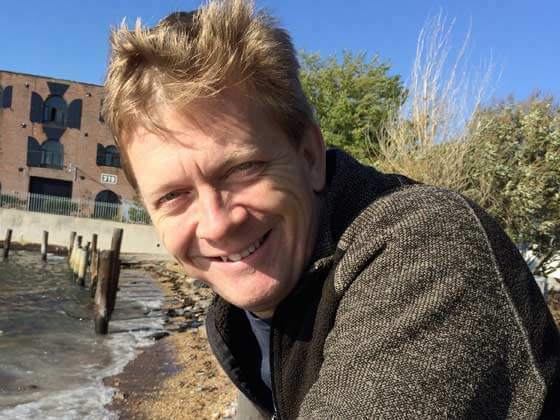 An expert in user experience and information architecture, Jim makes sure that every site and application we build is as intuitive and simple to use, as it is powerful. Logan is the official JJC mascot. He spends most days laying about the office begging for food and thinking up new multimedia campaign ideas—mostly centered around securing more food from the rest of the staff here. 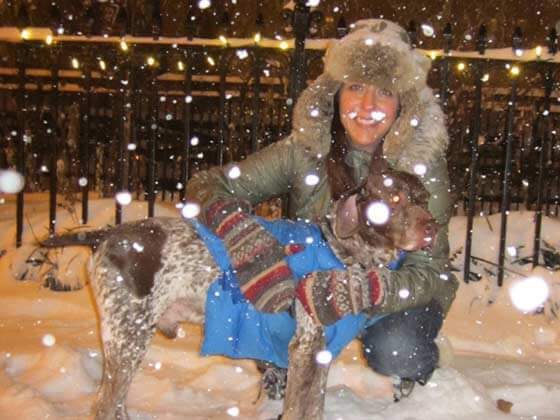 He also loves spending time with his crew at the Madison Square Park Dog Run. 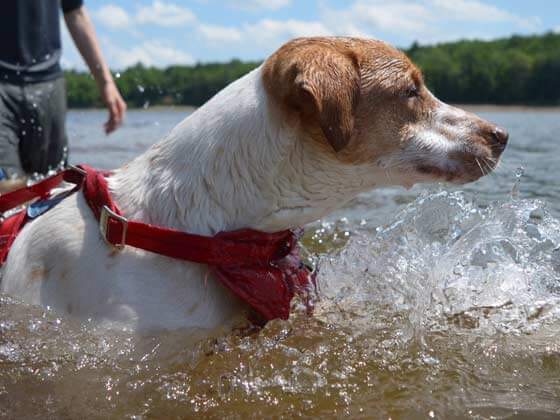 Logan was rescued from a terrible place called Dead Dog Beach in Puerto Rico. All of us here are forever grateful to The SATO Project for the amazing work they do. We are as passionate about what we do today as we were when we first opened our doors. Each completed project makes us even more hungry. Hungry for the next challenge...the next win...the next opportunity to dispense with the status quo and really make a difference for our clients. From towns and cities, to non-profits to Fortune 500 brands to startups, we are all about doing exactly what’s right for our clients and making a meaningful difference in their lives and in the lives of their customers. We focus on one thing—results. 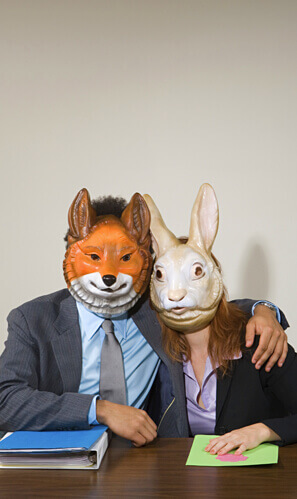 We do it with integrity and we make sure that everyone always has fun along the way. "The JJC team always seems to bring that something extra. An unexpected twist or point of view, that takes an idea to a whole new place. 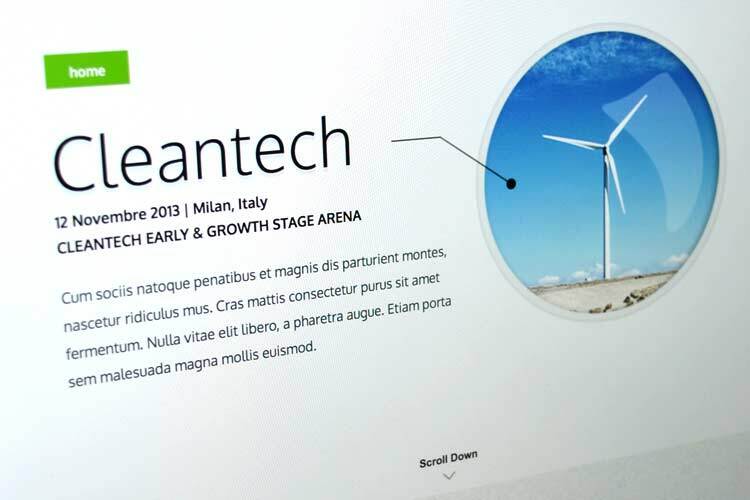 On the technology side, OrgCenral, their CMS solution, is a thing of beauty." 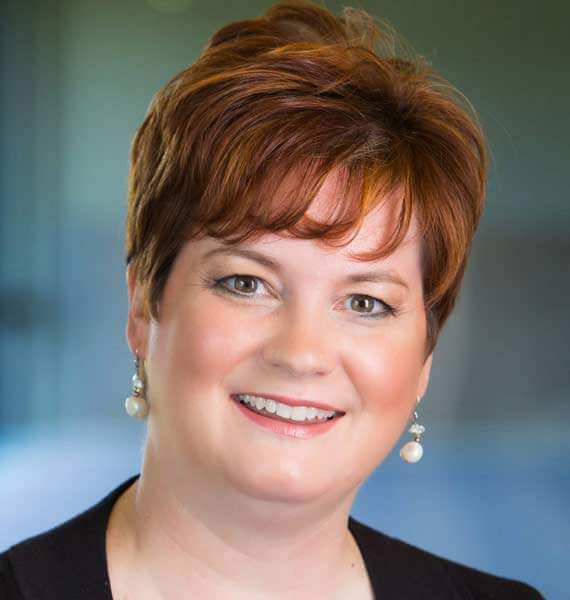 "I’ve been highly impressed by the commitment, creativity, and 'get it done' capability of the JJC team. Not only has the quality been exceptional, they have repeatedly “gone the extra mile” in supporting our veteran-focused charitable endeavors. JJC is truly a patriot enterprise!" "Franklin County has a lot of moving parts. 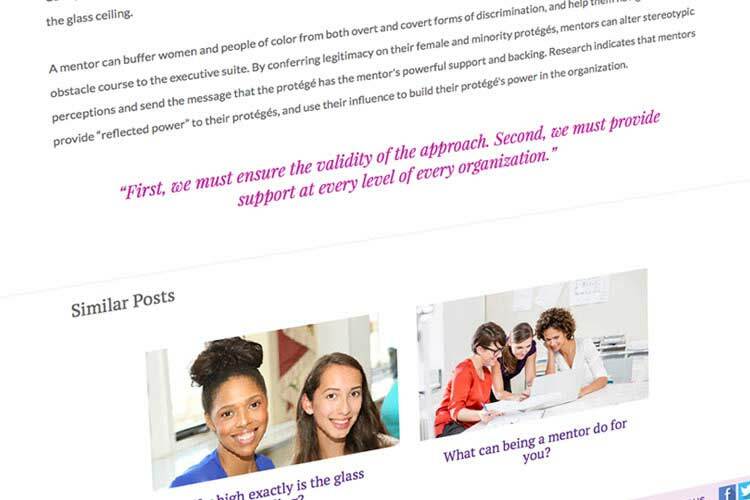 In the process of redesigning our website, the JJC team also helped us tell our story better, decentralize our workflow across all departments, manage all kinds of operations from a single system and maintain our brand integrity at every point along the way. We’ve also won an award or two together!" Tell us your story. Challenge us. Tell us a joke. Or just say Hi. To get in touch, just pick up the phone or complete the form below (we promise not to spam you or sell your information to people with bad intent). We look forward to connecting. Your message has been sent. We'll be in touch soon. Please stare straight ahead for 30 seconds. Thanks. We have just completed a full frontal optical scan. We've cloned your unique retinal cell layout and uploaded your image to our servers. Within the next three minutes, we will run an FBI identity check and cross reference all findings with the Wisconsin branch of the KGB. If you are “Wanted” we will turn you in and collect the bounty. If you’re unwanted, you have our sympathy. Don’t give up, there’s someone out there for everyone. They just haven’t found you yet. All of it and however we see fit. 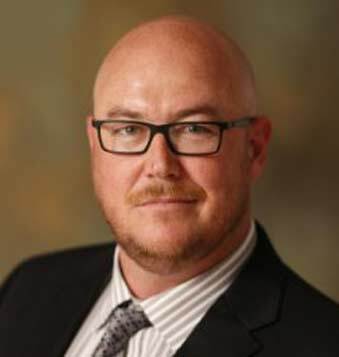 How does JesseJames Creative protect customer information? Logan, guard dog extraordinaire, is on the case providing round the clock protection for our customers’ information. Logan is very dedicated to his mission. And he loves rope toys. Cookies are a delicious baked good. Available in a variety of flavors ranging from chocolate chip to oatmeal raisin to oatmeal chocolate chip. Frosted cookies such as the “black and white” and the cream-filled “sandwich cookie” are also quite tasty. All will make you fat. Beyond that, we’re not saying. Will JesseJames Creative share the information it collects with outside parties? How does JesseJames Creative protect the privacy of minors? JesseJames is committed to protecting the privacy of impressionable young children. Which is why when we catch one doing goofy things on YouTube, we tell no one. We respect their privacy. Have a nice day. And by the way...nice shoes. By using our website, you consent to the collection and use of your private information by JesseJames Creative, Inc. and all of its subsidiaries worldwide. You consent to enter into a long-term, retainer-based relationship with JesseJames Creative. You consent to a series of painless psychological experiments including, but not limited to studies involving sleep deprivation, phobia confrontation and the effects of subliminal advertising. We hate those annoying little opt-in boxes, so we'll just assume that since you're shaking your head, that's a yes.